The opinion page of the Guardian newspaper of October 28, 2013, page 15, has an article titled Gov Obi's anti-Igbo legacy written by one Ekene Nwabichili. The thrust of the writer's discourse was the reaction of the Anambra state government to the Lagos deportation of Ndigbo. Nwabichili claimed to have allowed “considerable time to pass so that people would be in a position to examine this matter”. He might have done so, considering the time of deportation and the publication of the article. However, his judgment did not altogether reflect a balanced view. The claim of “mindless propaganda campaign against the Lagos state government” by Governor Obi is not supported by overwhelming public approval for the governor's action. Very few subjects have generated the kind of tension the deportation issue raised. This is not without reason. Lagos is a home to most Nigerians, including the Igbo man. The latter, unarguably the most peripatetic of all the tribes in Nigeria, works and settles in any part of Nigeria. He feels at home anywhere he settles, works hard for success and contributes immensely to the development of his host community. He withholds nothing back and sometimes, immodestly, flaunts his achievement to the discomfort of his hosts. He prides himself a successful person if he goes a step further to build house(s) in the town, even if he is yet to build any in his home town. He adopts his new place as home and in time, visits to his native home becomes few and far between. This is for the successful Igbo man. But for others not as lucky, who bear the unremitting malice of fortune, survival depends, to a large extent, on the lap of the gods. Though they do not work any less than their more successful brothers, nonetheless they, more or less, survive in the street. Among this group were to be found those deported by the Lagos state government on a charge of destitution and mental instability. The objection of the Anambra state government at the distasteful manner in which the deportees were disgorged at the foot of the Onitsha bridgehead at an ungodly hour on that fateful July morning has got the writer and others of his ilk kicking. The writer thinks because Lagos is welcoming to Ndigbo, which he ruefully cited Obi's successes in the city as example; the governor ought to have applauded deportation. He went as far as suggesting that every negative view expressed on the matter since the case was encouraged by the position of the Anambra State government. For effect he alleged that a blogger by name Odera Igbo asserted that the attempted assassination of Chief Obianodo, CEO Young Shall Grow Motors was carried out by Lagos state agents. As unfortunate as this is, Nwabichili should know that bloggers do not need any prompting to do what they please just as Fani-Kayode could, without recourse to Lagos state government, take swipe on entire Igbo. It is common knowledge that Fan-Kayode has since expressed strong disapproval over Governor Fashola's apology. That the rights of some Nigerians were violated upon insufficient claim of destitution and mental instability meant nothing to this writer. That they were herded in long trucks, hemmed in by armed police escorts and discharged at the foot of Onitsha Bridge at an ungodly hour is also meaningless. But one would have thought that the deportees would be sent to their respective states rather than dump all of them at Onitsha. It does not seem responsible on the part of any government not to do anything. It would be recalled that Anambra state government had to write to the presidency when it became obvious that Lagos, having deported some people to the state last year, was determined on this course of action. It is possible that those who condemn Obi are not aware of this fact which was certain of continuing unless something was done about it. Though Governor Fashola has since apologized to Ndigbo over this it is surprising why the writer still imagines hurt where none exists. Understandably, it is all about the November 16 governorship election in Anambra State to which the APC has big interest. The party's government in Lagos state realized, rather late, that it misfired on the deportation. To the extent the apology tendered by Governor Fashola is seen by many as designed to straighten the rash action. A critical review of the entire scenario would show that those defending deportation are the ones jeopardizing the interest of the Igbo man in Lagos. This is because the ground they concede today, for political gains, would be difficult to reclaim tomorrow. At any rate it would be interesting to know what those disapproving of Obi's action will do in similar circumstance. Would they write Fashola a panegyric or dance azonto in thankfulness? The position of Obi's critics on the deportation is hard to justify. The argument that deportation was not targeted at a particular group but every transgressor of the Lagos beautification law, including the Yoruba, is unconvincing. It does not make the deportation any less an offence. Obi's action to all intents and purposes is conciliatory. What would another governor, with little less of his peaceful disposition, do in similar circumstance? If the view expressed by the writer of the article were subjected to plebiscite, he would find out that the considerable time he claimed to have allowed was in vain. Yes! Because there are those who feel that with the second deportation, Anambra state government should have secretly rounded up beggars in the state to be joined by lepers along Ore road and sent to Lagos. Those propagating this line of action believe that was the quickest way to nudge Fashola to the harshness of reality. Had that happened, the real meaning of toying with the security and future of the Igbo man in Lagos would be more apparent. 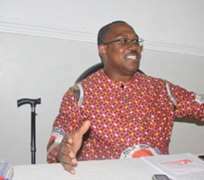 But Governor Obi preferred arbitration to resistance yet the likes of Nwabichili still kick. Perhaps what he and others wanted Obi to do nothing because beyond the letter he wrote to the presidency for possible redress Obi has not taken any retaliatory action. Except the writer sees where others are blind, bringing the evils of deportation to public consciousness, rather than endanger the Igbo in Lagos or any other tribe, will strengthen them. What Obi did, in the circumstance under review, was expected of his office. With the N1billion suit already filed against Lagos state government by the victims it is likely the frequency of deportation will reduce. Aside those who want to play politics with this, the relationship between the Igbo and Yoruba cannot be threatened by Governor Obi's action. Disclaimer: "The views/contents expressed in this article are the sole responsibility of Louis Ejikeme and do not necessarily reflect those of The Nigerian Voice. The Nigerian Voice will not be responsible or liable for any inaccurate or incorrect statements contained in this article."